This stir fry really is simple and easy. This is another Asian meal right out of our kitchen here at Splendid Recipes and More. When it comes to food there are always health benefits, that is if you are eating the food in a healthy way. This recipe includes red pepper flacks, and if you have a problem with your appetite, that is wanting to eat to much and possibly putting on a few extra pounds, red pepper flakes can help. Adding 1/2 teaspoons of red pepper flakes three times a day to what you eat, you can cut down your appetite by 30%. Of course if you cut out simple carbohydrates (refined carbs) from your diet as well, and add complex carbs (100% whole grains, including the fiber), you can also suppress your appetite another 30 to 40 percent. Complex carbohydrates digest slower, leveling your blood glucose not spiking it, and giving you energy for longer periods as well as a full feeling for 3 to 4 hours. Heat some avocado oil in a wok or large pan, and fry the beef on both sides. 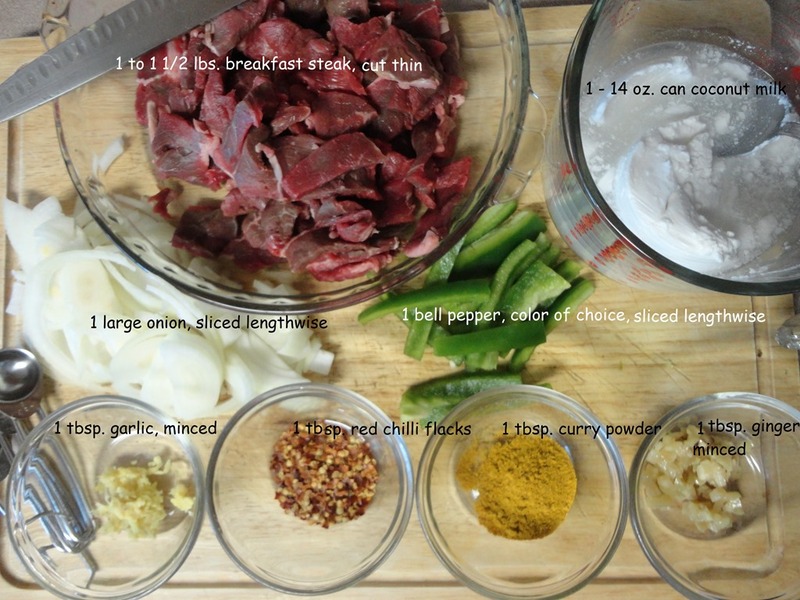 Add the following 6 ingredients and stir-fry some more till the beef is thoroughly cooked. Add coconut milk; simmer on low heat for 10 -15 minutes more. Plate and serve with a side of rice. Spicy Thai Coconut Stir-Fry…and a Surprise out Running! Thai Chicken Curry in a Hurry – What’s for Dinner Tonight? 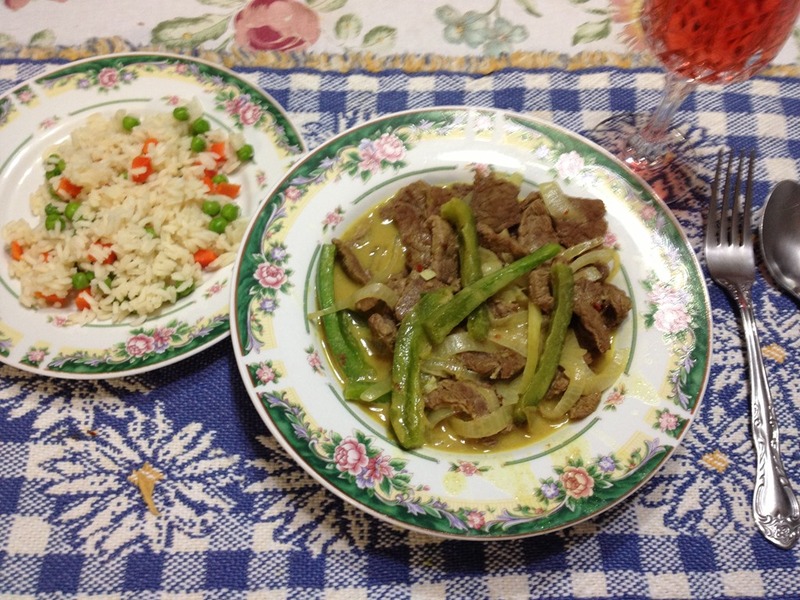 This entry was posted in Beef, Main Dish and tagged Beef, Coconut milk, Complex carbohydrates, Cook, Crushed red pepper, Curry, Garlic, Home, red pepper, red pepper flakes, stir fry. Bookmark the permalink. I thought it was green beans and it turns out it’s green peppers. 🙂 ❤ Green Beans! Then you might like this https://splendidrecipesandmore.com/2014/02/18/sausage-and-tortellini-soup/ which has green beans in it. I have another recipe I will post soon that is a pasta dish that includes green beans. Thanks Jackie for stopping by and leaving a comment!! You may try this exact recipe without the curry. I think it’ s more delicious. Also, try a recipe without the meat….. and use squash ( cabochan variety, and stringbeans * longbeans*) and instead of curry, add a tablespoon of shrimp paste ( or bagoong, Philippine shrimp paste ). This recipe without the curry is very Southeast Asian . Thanks Renxkyoko for your culinary ideas and replacements. I will give them a try. Just to let you know, I use curry in many of my Asian recipes, because curry is an anti-inflammatory herb, as wells as fights against cancer cells. I don’t have shrimp paste, but I do have fish paste, will that work as well? Thanks for taking the time to view the post Renxkyoko, and leaving your comment.